Saskia Sassen: "Many of the spaces we believe to be public are privately owned"
Dutch sociologist Saskia Sassen, renowned across the globe for her work on global cities, discusses the modern metropolis, empty buildings and whether Latin American states are too weak to resist urban takeovers by the private sector. 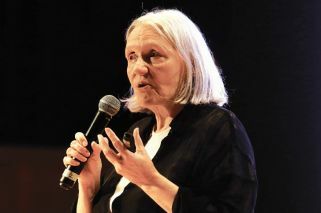 Dutch sociologist Saskia Sassen is one the most respected voices in the field of urban studies. She became increasingly well-known in the early 1990s after the publication of her hugely influential book The Global City: New York, London, Tokyo (1991). At a time when analysts (such as the recently deceased Paul Virilio) were warning about the abandonment of large cities, Sassen argued the contrary, positing that a city’s economic function at an international level was one of its defining factors — and that these global cities would become increasingly important in the years to come. Over the last few years, and especially since the publication of Expulsions: Brutality and Complexity in the Global Economy (2014, version in Spanish published by Katz Editores), she has focused on studying the social consequences of the global economy, including the displacement of villages and the growing inequalities that accompany these processes. In this interview with the Times, hours after her recent keynote speech at the 2nd International Congress of Urbanism and Mobility, Sassen analysed some of the main challenges faced today by cities such as Buenos Aires, London and New York. In your keynote address at la Usina del Arte you mentioned a project of yours, called the “Ethics of the City,” which aims to serve people and not the economy. Why do you say the diversity of urban life is at risk? This is strongly related to a change I pointed out in The Global City. In the 1970s, big cities were impoverished and the middle classes were moving out. At the same time, corporations did not feel the need to be downtown, since they had most of the necessary resources inside the company. The city was an abandoned space. The best example was New York: all kind of experts were saying: ‘The city is finished.’ But I like watching from the edges of the system and I started to see that something else was happening. Doing work on immigration I happened to meet the cleaners of the offices of Wall Street, which back then were all Dominicans and worked in those huge buildings owned by insurance companies. When the rest of the employees left — because back in the days Wall Street was not ‘open’ 24-hours — and the building looked empty, the cleaners would say to me “Let’s have lunch.’ They said ‘Lunch’ even though it was midnight (smiles). And they showed me the interior of one of those big buildings, which were the offices of big firms such as Goldman Sachs. It was then that I realised that there were people from so many nationalities working there, and I learned a lot about globalisation. Several companies had left the city, but in the 1980s – with the beginning of privatisation and deregulation – any firm with the intention of working in seven or 20 countries began to realise that it would need law experts, investment experts… and that’s what these companies began to scout everywhere where they had operations, be it Paris, Tokyo or Frankfurt. We’re talking about well-educated, very smart people. This is a key economic factor that ‘revalued’ the cities. Lots of experts were saying ‘In a digital world, the physical won’t matter.” But I would contradict them and tell them: ‘At the moment you need expertise on the business preferences of Mongolians or on Argentine laws on how to make business with the agricultural sector, you’ll need the city again.’ And what happens, in terms of urbanism, is that in the same big houses where three modest families would live, you now have these brilliant young people. This sector is launching a huge takeover of a large portion of these cities which has expelled entire groups of people that until not long ago could live in the city but are now forced to live in the outskirts. They even kicked out the firemen! In Die Hard, the movie starring Bruce Willis, the owners of the big office towers were the Japanese. Who are the ones leading the urban takeover of the historic centres today? That would be the Chinese. They’re very international: investors and developers at the same time, they started a freight train from Beijing to London… they have they own way of doing it. It is widely assumed that the classic way of expelling certain groups from cities is through affluent families arriving in a certain neighbourhood, which pushes up rent prices so much that original residents are forced to move elsewhere. But you are saying that the trend now is big companies buying offices, just to own them. Is this an invisible phenomenon? The key lies in mathematical algorithms. This is not like macroeconomics: we’re talking about a whole new level of intelligence, different to how it worked until the 1980s when it was more about routine intelligence, the ability to see little things that could be changed. Now the building you see is no longer the result of some kind of economic process, but the effect of an invisible economic system. We’re still trying to understand this model, a model so extractive that I feel inclined to call it antieconomic — because calling it an ‘economic’ phenomenon would not help us understanding it. It’s the logic of extraction, like in the case of mining or plantations. But those models are visible. These are not. What does this mean for cities in the immediate future? Cities have gone through several epochs. There were times when they grew and became powerful, and then went through other times when they lost that power. No stage lasts forever. At this point what I’m seeing is a phenomenal grabbing process that will find its own limits, too. This “empty buildings” phenomenon is new, they are buying the buildings in order to own the land. It’s not the building itself what matters! There’s something very abstract at stake. The key question here is: what’s next? What should be the role of those working in urban studies today? There are two ways, two levels of involvement. You can take the case of London: plans are very good, urban planners are always working to take care of public space, I think it’s impressive. The same cannot be said of New York, where there are no resources and no culture of protecting the public. It depends. There are countries like Chile, for instance, that nowadays feel proud of looking like North America. But I would say there are two ways to beautify a city: one of this one, with fancy buildings that only exist in a world of wealth. The other is to focus on public spaces, public transport… though we know that many of the spaces we believe to be public are actually privately owned. Exactly, it’s part of an arrangement where private owners always win: ‘I build this tower but in exchange I get all these area of public space.’ Did you know that all the streets in Potsdamer Platz [in Berlin] are privately-owned? These are new forms. Aren’t Latin American states too weak to resist these urban takeovers? Yes, especially because until now we’re talking about a very specific phenomenon, involving just a few large buildings. It’s a new trend. Most analysts, be they from the government or from the private sector, don’t seem to be aware of these new forms, the same way they never understood that subprime mortgages were not an instrument that would help modest families to own a home. This is a very profound yet invisible change. You see a little house. But what’s actually happening is that millions of little houses are working, at a very abstract level, as security-backed assets. Do you believe there’s such a thing as gentrification in Latin America? I don’t have data for all the big cities in Latin America, but I can name a process that’s really taking place in those cities — financialisation [NB: according to Sassen, this is a mechanism that replaces “the prospect of democratic decision-making by an expansion of opaque transnational networks”]. Wherever I give these lectures, I see one or two people who always come to tell me that this is also taking place in their cities. Almost 40 percent of Argentina’s population is living in Buenos Aires and its metropolitan area. Would you say that the fact that it has now established itself as a global city, interconnected with other urban markets, further complicates plans to decentralise the country? The irony is that these new phase is launched at a time when the big cities — New York, Paris, London, probably Buenos Aires — have become poorer, because several big economic actors have moved away from them. Even though your time in Buenos Aires has been very short, what was your impression of the city? You haven’t been here for some years. I lived in Buenos Aires under some terrible, horrible dictatorships [Sassen came to Argentina in 1951 and spent part of her childhood and adolescence in Argentina] but now I love it. It still has some of that wonderful energy I remember it had when it was no longer under authoritarian rule. It’s a great city! Of course, like every city, it has too much inequality, too much social injustice.